Discussions, or discussion forums, foster interaction among learners and between learners and the course team. You can set up different topics to guide these interactions when you create your course, and then run and moderate discussions throughout the course to encourage participation and develop course community. Discussions are also excellent sources of feedback and ideas for the future. For information about running and moderating discussions, see the following sections. Some features of discussions are available when discussions are accessed in a web browser, but not when accessed in the edX mobile apps. For information about the differences between discussions on the edx.org site and in the mobile apps, see Discussions in the edX Mobile Apps. For information about how using cohorts in your course affects how your course team might moderate course discussions, see Managing Discussions in Courses with Learner Cohorts. The Participating in Course Discussions section describes features that are available to all discussion participants, and might be useful to learners who are new to online discussion forums. You can share the section with your learners by, for example, adding a “Never Used a Discussion Forum Before?” post that includes the information you think will be most useful to them. Learners and the course team use course discussions to share ideas, exchange views, consider different viewpoints, and ask questions. In a discussion, there are three hierarchical levels of interaction. A post is the first level of interaction. A post opens a new subject. Posts can be made as questions, to solicit a concrete answer, or as discussions, to start a conversation. When you add a post, you decide whether to add it as a Question or as a Discussion. All course team members and enrolled learners can add posts, responses, and comments, and view all of the posts, responses, and comments made by other course participants. Members of the course community, learners as well as the course team, can be given permission to moderate or administer course discussions through a set of discussion administration roles. The course team members that you set up in Studio or on the Instructor Dashboard in the LMS are not granted discussion administration roles automatically. Only people who have a discussion administration role can view all of the discussion contributions, for example in courses using cohorts. Discussion administration roles must be explicitly granted to members of the course team for them to moderate or administer course discussions. The course author, and any team members with the Admin role, can grant discussion administration roles. For information about assigning discussion privileges, see Assign Discussion Administration Roles. Not all options for moderating discussions are available when discussions are accessed using the edX mobile apps. For information about the differences between discussions on the edx.org site and in the mobile apps, see Discussions in the edX Mobile Apps. Discussions in an edX course include both broad topics on course-wide areas of interest such as “Feedback”, “Troubleshooting”, or “Technical Help”, and the content-specific topics that you add to course units as discussion components. You create both types of discussion topics in Studio. For more information about creating discussion topics, see Create Course-Wide Discussion Topics and Create Content-Specific Discussion Topics. For information about configuring discussion topics in courses that use cohorts, see Setting up Discussions in Courses with Cohorts. All courses include a page named Discussion. When you create a course, a course-wide discussion topic named “General” is already included by default. You can add additional course-wide discussion topics to guide how learners share and find information during your course. Such course-wide topics might include Introduction and Announcements, Feedback, or Troubleshooting. Discussions in these topics can begin as soon as your course is available. Make sure each discussion topic in your course has a unique name, whether it is a course-wide topic or a content-specific discussion topic that you add as a discussion component. If different discussion topics share the same name, learners might be confused as to which discussion topic they are participating in. For example, do not add a content-specific discussion topic named “General”, because a course-wide discussion topic named “General” already exists in every course. To create a course-wide discussion topic, follow these steps. Scroll down to the Discussion Topic Mapping policy key. By default, its value looks like this. Copy the three lines provided for the General topic and paste them above the closing brace character (}). Replace the second “General” with the quoted name of your new topic. For example, name the new topic “Questions about the Course”. Change the value for the second “id” to a unique identifier. For example, append a reference to the name of the topic. In discussion topic IDs, you can use only alphanumeric characters and these special characters: underscore, hyphen, and period. Add a comma after the first closing brace (},). Studio checks the syntax of your entry and reformats your entry to add line feeds and indentation. Scroll back to the Discussion Topic Mapping field to verify that your entry was saved as you expect. Entries that do not contain all of the required punctuation characters revert to the previous value when you save, and no warning is presented. 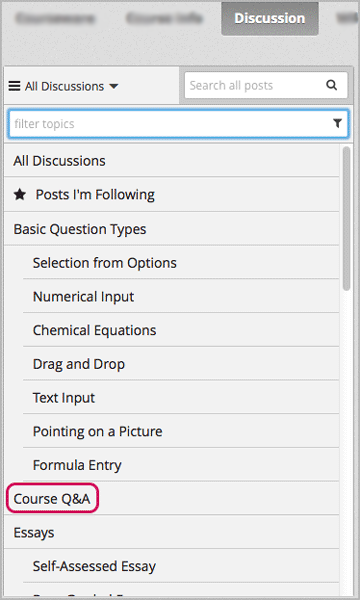 When learners select the Discussion page for your course, the drop-down Discussion list now includes the topic you added. In courses that use cohorts, the course-wide discussion topics that you add are unified. All posts can be read and responded to by every learner, regardless of the cohort that they belong to. You can optionally configure these topics to be divided by cohort. For more information, see Course-Wide Discussion Topics and Cohorts. To create a content-specific discussion topic, you add a discussion component to a unit. Typically, you do this while you are designing and creating your course in Studio. Follow the instructions in Working with Discussion Components. The result is a discussion topic associated with a unit and its content. When learners access courses using the edX mobile apps, content- specific discussion topics cannot currently be viewed “inline” as part of the course content, although they can be viewed along with course-wide discussions on the Discussion page. Follow the recommended steps to add discussion components. Do not create discussion topics by using the Duplicate button in Studio, and do not reference the same discussion ID in more than one place in your course. Duplicated discussion components result in discussion topics that contain the same conversations, even if learners post in different discussion topics. For information about the visibility of content-specific discussion topics, see Visibility of Discussion Topics. 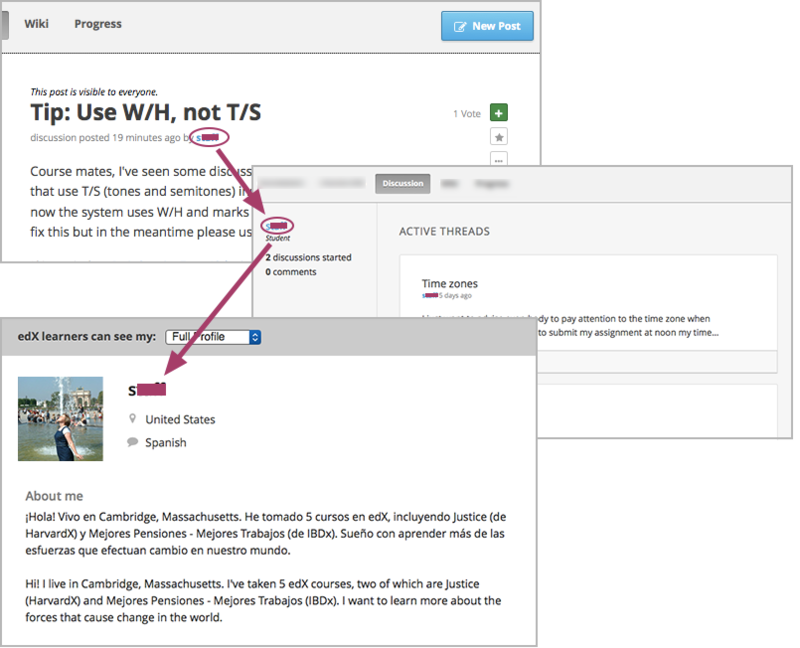 In courses with cohorts enabled, all content-specific discussion topics are divided by cohort when you first add them. Posts by learners to divided discussion topics can only be read and responded to by members of the same cohort and course team members who have a discussion administration role. You can change the configuration of content-specific discussion topics to make them unified and available to all learners in the course. For more information, see Content-Specific Discussion Topics and Cohorts. You can designate a team of people to help you run course discussions. Team members who have a discussion administration role have additional options for working with posts, responses, and comments. The course team members that you set up in Studio or on the Instructor Dashboard are not automatically granted discussion administration roles. Discussion administration roles must be explicitly granted to members of the course team for them to be able to moderate or administer course discussions. The course author and any team members who have the Admin role can grant discussion administration roles. available when members of the discussion administration team work in a web browser. The edX mobile apps do not currently offer moderation options. For more information about differences between discussions on the edx.org site and on the mobile apps, see Discussions in the edX Mobile Apps. Discussion moderators can edit and delete messages at any level, review messages flagged for misuse, close and reopen posts, pin posts, and endorse responses. Posts made by moderators are marked as “By: Staff” in the list of posts. Responses and comments made by moderators have a colored “Staff” identifier. This role is often given to course team members who already have the Staff role. Discussion community TAs have the same options for working with discussions as moderators. Posts made by community TAs are marked as “By: Community TA” on the Discussion page in the discussion navigation pane. Responses and comments made by community TAs have a colored “Community TA” identifier. This role is often given to learners. Discussion admins have the same options for working with discussions as moderators, and their posts, responses, and comments have the same “Staff” identifiers. This role can be reserved for assignment to course team members who have the Admin role only: the discussion admins can then both moderate discussions and give other users discussion management roles whenever necessary. Before you can assign roles to your discussion team, you need their email addresses or usernames. To get this information for a course team member, on the Instructor Dashboard select Membership, and then select either Staff or Admin. To get this information for an enrolled learner, on the Instructor Dashboard select Data Download, and then Download profile information as a CSV. You can assign a course team role to any user who is already enrolled in your course. To assign a discussion administration role, you must be the course author or an Admin. In the Course Team Management section, select Discussion Admins, Discussion Moderators, or Discussion Community TAs. To remove a role from a user, you must be the course author or an Admin. From the list of users who currently have that role, select the user you want to remove, and then select Revoke access. The names that you specify as the category and subcategory names for discussion components are not visible on the Discussion page in the LMS until after the course has started and the unit is released. However, “seed” posts that you create in content-specific discussion topics before a course starts, or before the unit is released, are immediately visible on the Discussion page, even though the containing category or subcategory names are not visible. EdX recommends that you do not create posts in content-specific discussion topics before a unit is released. For more information about release dates and the visibility of components, see Controlling Content Visibility. In contrast, course-wide discussion topics that you create on the Advanced Settings page in Studio, including the default “General” discussion topic, are immediately visible, regardless of whether the course has started. They are not associated with any particular section or subsection of the course, and are not subject to release dates. On an ongoing basis, the members of your discussion team run the course discussion by making contributions, endorsing responses, marking answers as correct, and guiding learner messages into pertinent threads. Techniques that you can use throughout your course to make discussions successful follow. Use “[OFFICIAL]” at the start of announcements about changes to the course. Provide information about corrected errors with a subject that begins “[CORRECTIONS]” or “[ERRORS]”. To help learners learn how to get the most out of course discussions, and find the best discussion topic to use for their questions and conversations, you can seed discussion topics in course-wide discussion topics before the course starts. Some examples follow. In the General topic (which is included in every course by default), add an [INTRO] post to initiate a thread for learner and course team introductions. EdX strongly recommends that you do not create seed posts in content-specific discussion topics before the course starts or before the containing unit is released. The category and subcategory names for content-specific discussion topics are subject to the release visibility of their containing unit, and are not visible until the unit is released. For more details, see Visibility of Discussion Topics. To encourage longer, threaded discussions rather than many similar, separate posts, the discussion team can use these techniques. However, be aware that long threads (with more than 200 responses and comments) can be difficult to read, and can therefore result in an unsatisfactory experience in the discussion. You can only pin or close posts and mark questions as answered when you work in a web browser. You cannot complete these activities when you work in an edX mobile app. Pin a post. Pinning a post makes it appear at the top of the list of posts in the discussion navigation pane on the Discussion page. As a result, it is more likely that learners will see and respond to pinned posts. You can write your own post and then pin it, or pin a post by any author. Select the “More” icon and then Pin. Endorse a response. Endorsing a response indicates that it provides value to the discussion. Select the “check mark” (or tick mark) icon for the response. Mark a question as answered. You use the same procedure to mark a response as the correct answer to a question as you do to endorse contributions to a discussion: select the “check mark” (or tick mark) icon for correct answers. Close a post. You can respond to a redundant post by (optionally) pasting in a link to the post that you prefer learners to contribute to, and prevent further interaction by closing the post. Select the “More” icon and then Close to close it. Provide post/response/comment guidelines. You can post information from the overview in this section, or the anatomy of edX discussions in the next section, in a course-wide discussion topic (such as General) to provide guidance about when to start a new thread by adding a post, responding to an existing post, or commenting on a response. The members of a course discussion team monitor discussions and keep them productive. They can also collect information, such as areas of particular confusion or interest, and relay it to the course team. Developing and sustaining a positive discussion culture requires that sufficient moderator time is dedicated to reviewing and responding to discussions. Keeping up-to-date with a large MOOC forum requires a commitment of 5 or more hours per week, and involves reading threads, replying to and editing posts, and communicating with the rest of the discussion administration team and other members of the course team. For information on setting up moderators for your course, see Assign Discussion Administration Roles. If you want to find out more about a specific discussion participant, you can view that learner’s edX profile. Learners can have either a limited profile or a full profile. To view a learner’s profile, follow these steps. On the Active Threads page for that learner, select the learner’s username. The following image shows a learner’s username in a post, the learner’s username on the Active Threads page, and the learner’s profile page. For more information, or to create your own profile, see Exploring Your Dashboard, Settings, and Profile. You can also share the Participating in Course Discussions section with your learners. It describes features that are available to all discussion participants, and may be useful to learners who are new to online discussion forums. Discussion monitors can cultivate qualities in their own discussion interactions to make their influence positive and their time productive. Publicize issues raised in the discussions: add questions and their answers to an FAQ topic, or announce them on the Home page. Discussion moderators, community TAs, and discussion admins can edit the content of posts, responses, and comments. Messages that include spoilers or solutions, or that contain inappropriate or off-topic material, should be edited quickly to remove text, images, or links. Log in to the site and then select the course on your Current Courses dashboard. Open the Discussion page and then open the post with the content that requires editing. You can select a single topic from the drop-down list of discussion topics, apply a filter, or search to locate the post. Discussion moderators, community TAs, and discussion admins can delete the content of posts, responses, and comments. Posts that include spam or abusive language may need to be deleted, rather than edited. Open the Discussion page and then open the post with the content that requires deletion. You can select a single topic from the drop-down list of discussion topics, apply a filter, or search to locate the post. Learners have the option to report contributions that they find inappropriate. Moderators, community TAs, and admins can check for messages that have been flagged in this way and edit or delete them as needed. For a learner who continues to misuse the course discussions, you can unenroll the learner from the course. For more information, see Unenroll Learners from a Course. If the enrollment period for the course is over, the learner cannot re-enroll. You can close the discussions for your course so that learners cannot add messages. Course discussions can be closed temporarily, such as during an exam period, or permanently, such as when a course ends. When you close the discussions for a course, all of the discussion topics in course units and all of the course-wide topics are affected. Existing discussion contributions remain available for review. Course team members with the Staff, Admin, Discussion Admins, Discussion Moderators, and Discussion Community TAs roles are not affected when you close the discussions for a course. Users with these roles can continue to add to discussions. To make sure your learners understand why they cannot add to discussions, you can add the dates that discussions are closed to the Home page and post them to a General discussion. To close course discussions, you supply a start date and time and an end date and time in Studio. You enter the values in the following format. The dates and times that you enter are in Coordinated Universal Time (UTC), not in your local time zone. You might want to verify that you have specified the times that you intend by using a time zone converter such as Time and Date Time Zone Converter. You enter an actual letter T between the numeric date and time values. The first date and time indicate when you want course discussions to close. The second date and time indicate when you want course discussions to reopen. If you do not want the discussions to reopen, enter a date that is far in the future. Quotation marks enclose each date-time value. A comma and a space separate the start date-time from the end date-time. Square brackets enclose the start-end value pair. You can supply more than one complete start and end value pair. A comma and a space separate each pair. For example, to close course discussions temporarily for a final exam period in July, you enter these start and end dates. To add a blackout date that closes course discussions permanently on 9 August 2016, you add these start and end dates. Enter the start and end date for the time period during which you want discussions to be closed. Be sure to use the required date format specification. To define the temporary blackout period in the example above, the field contains start and end dates in the following format. To add the dates that close the discussions permanently, the field contains a second pair of start and end dates in the following format. Learners can participate in course discussions using the edX mobile apps as they do on the edX site, but there are some differences in the actions that moderators can take in discussions using the mobile apps. To perform moderation or administrative tasks for your course discussions, you need to work in a web browser. When learners access courses using the edX mobile apps, content-specific discussion topics cannot currently be viewed “inline” as part of the course content, although they can be viewed along with course-wide discussions on the Discussion page.